Lichfield & District Ladies Darts League held their annual presentation on Saturday January 12th with Dennis The Menace Priestley as their guest professional darts player presenter. During the evenings festivities a raffle was held that raised £217, which along with a £50 donation, is being given to the Lichfield Stroke Society. A great time was had by all at the dance and many pictures of the Darts Presentation were taken some of which will appear in the “Photo Gallery 2013 (LINK),” and others on the FaceBook page. Included here is a picture of Mary Allan with Dennis as she announced her retirement from darts after 34 years. She was one of the very first ladies who joined the league in 1978, and at the grand old age of 87, she decided to give it up, she left the presentation to a standing ovation as she is such a special lady. 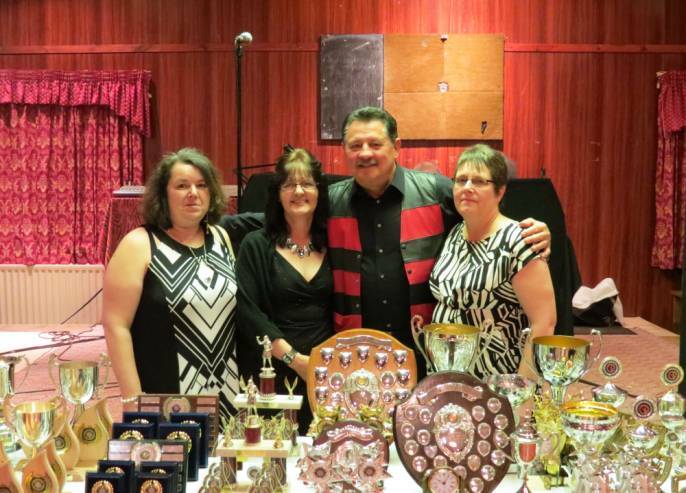 The other picture is of Marion Toon (Chairperson), Jenny Sawyer (Secretary) and Alison Fisher (Treasurer) along with Dennis Priestley and a lot of trophies! With one season just finished the League are preparing to start all over again and will be holding their Annual General Meeting at Lichfield Social Club on the 22nd January, 2013 at 8.30pm. If there are any ladies that would like to join the league they are very welcome to attend to the meeting.